Ever since i am introduced to the vedic dharma,i am interested to hear and tell more about vedas. In a class of an acharya who happen to dedicate his life to spread hindu values, i heard that he does not suggest us to learn vedas. He ask us only to hear it because it is difficult to learn.Naturally my doubt was "is there any effect for veda mantras when you are just hearing it without understanding the meaning"? My heart says yes and brain says no to the question. I decided to ask around.Mr. Prasad Sreelakshmi believes there is benefit in hearing the mantras but he stopped short of saying how and what. Mr. Syam Sunder P is of the opinion that only after repetition that one get interest to learn the vedas. Mr. Jalandhar Mayashiv Shankhachuda is of the opinion that the Acharya's religion is that atleast people should study his meaning in a grim situation where study of vedas is neglected.Mr. Harija Mohan seems to like Bhagawad Gita a lot.She said that instead of seeing the book , one should read and understand the meaning. C. Muraleedharan Panchavati who uses an image of a sage as profile picture comes to the scene with a ladoo.He said his guru asked him to carryon asking for a ladoo.And since most of the people don't know about ladoo and the only available thing was jilabee. So some people called it jilabee.According to his logic, we must keep asking for ladoo and eat what ever we get until we get the right ladoo.How on earth are we going to verifty that it was the right one? No probs "GOD KNOWS EVERYTHING". What an answer sirji. See the remaining part of the answer. "AS PER KARMA PHALA WE MAY NOT GET WHAT WE WANTED! BUT THE CONTINUOUS REQUEST TO GOD GIVES IT! The manthras in sanskrit are arranged as per it! It has a literal meaning and a material meaning! I gave a material meaning above! The literal meanings are science and it carries the spelt meaning and rithmic notes which gives an aura to help us or destroy us! These manthras only require more explanation like rigvedha manthras which all have got link with saanghya saasthra , chandha saara and manthra sara ! Material meanings are puranas and literal meanings are upanishats!When both are linked,they are ithihasas!Vedhas are classified into four according to the yuga! In "kritha yuga" "dhyanam"/meditation got ultimate result in moksha! In "thraetha" yuga the "yajnam "got maximum result for moksha! In "dhwapara Yuga "the "pooja" does the job! In "kaliyuga" the nama japa brings the moksha! In kritha yuga the rigwedha was dominant because the sound and its vibrating techniques(words pronunciation) are used!So the accent of manthras was a must then! Rigwedha has the second part and is the ayurvedha!Ayur vedha consists of all medicines to create maintain and destruct a life! All the vedhas got 4 parts! They are not seperate from vedhas! The threatha yuga have the yajurwedha with its upa vedha as dhanurvedha!Yajurvedha deals with all yajnas and dhanurvedha with weaponery,including controlled nuclear technology! Ramayan shows many of such missiles/arrows! The dhwapara yuga has the pooja and manthras for the controll/fullfilment of wishes!Sama vedha is the vedha of yuga! It has a branch known as gandharva vedha,which deals with sounds and its effects !not rigs.In kaliyuga the adharvana vedha is used which deals with all material benifits of earth and hence we neglected it and is taken by the foreign countries! foreign countries except .....bharath.How pity of us! We could neither develope in spiritual study nor in economics ! We have 6 saasthras out of which one is tharka sasthra(arguement)!We are smart in that one! To win it we may be ready to make our mother a prostitute as udhanda sasthri did it with kakasseri bhatathiri! Another pity of us!The muslim and christians are though semitic in nature,propogate it nicely! But we on contrary to it make another pity of us!HE,WHO CAN'T HELP HIMSELF WILL NOT BE HELPED BY GOD ALSO!" Poonthanam chanted the vishnu sahasranamam wrongly but maelpathoor bhatathiri joked at him and corrected ! Poonthanam pronounced it as "mara prabhu"
Amara prabhu means master of eternity! Still poonthanam got paradise with body! bhatathiri got paralysed later and cured by writing narayaneeyam! So,has meaning got value or the spotless devotion to god? Kerala got spoilt because of ego of knowledge without bhakthi! If everythings are guru controlled,then who did the upanayana to lord siva and vishnu? What is the position of gods/godesses? I too got corrected some manthras through dharsan of god! So it is true!But all manthras are not like that! 1.Purusha sooktham meaning is important! 17,moksha manthrangal has accent importance! When bhakthi comes in full swing,meaning or accent got no function! dhevathas!Provided you must have a good faith! Mr Prasanth in on the affirmative that meanings are a must.And here come Mr. VKM who explains veda as knowledge.And knowledge should be learned with meaning. Oaththu cholluka (mantra chanting) is necessary for protection of the vedas. Acharya Sankara used to call those who hear vedas as donkeys which carry kumkum (Safron). In new age, not much people spend their time learning vedas. Vedas are the samhitas. Brahmana-Aryanyaka-Upanishads are different books. Except Katyaya sage, all ancient acharyas have accepted mantra samhitas as Apourusheya (one that is derieved from god and not a work of man) and brahmana-aranyaka-upanishad as Pourusheya (manmade). The same opinion is being explained by late shree pandit vedabandhu sarma and acharya narendra bhushan through their speeches / works / articles.Lot of veda pundits have held this view. Malayalis especially the spokesmen of Puranas will feel it difficult to accept such works.But such information is available. 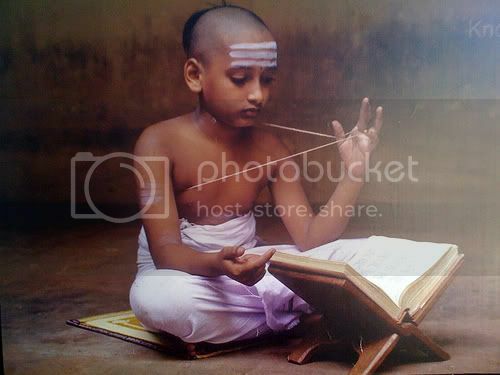 Vedas are unique in all ages.From creation to 197 crore years, they have been protected without a change in letter (akshara) or svara .There has been changes in Brahmana and Aranyaka books written by Rhishis. With regard to the number of Upanishads, there is big disagreement between pundits. 10,11,12,13,18, 108 , 1008 and the progression goes.It is interesting that there is even Allopanishad. Not many can learn vedas with angopangam (six anga and 6 upanga) and find the meaning in any age.I don't know how you will interpret the statement that not many are destined to be vediks.Also mantra chanting is important for it's protection.This process has been going on for ages.With great respect to the mahatmas and wisemen who spend their lifetime studying mantra chanting, i say that it is useless to learn vedas without knowledge.With great pride, i can say that still vedic gurukulas are there in many part of the country. For those who have inconvenience to learn vedas from there can hear pravachanas (speeches and not forecast) of pundits. You can read articles and books. You can do discourses with them.If you are interested, ways are unlimited.With great pranams to the guru, i pray all may get opportunity to learn vedas.